NEW BMW 4 SERIES COUPÉ. More dynamic, more agile and more comfortable. Design, presence and handling have all been meticulously optimised, making the new BMW 4 Series Coupé uncompromisingly ready for action. 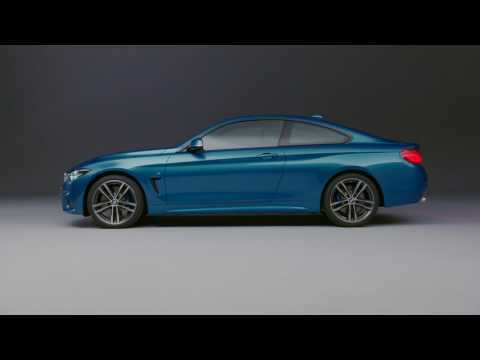 THE BMW 4 SERIES COUPÉ IN MORE DETAIL. Adapt the BMW 4 Series Coupé to match your personal preferences, with a choice of models. The BMW 4 Series Coupé is available in SE, Sport, Luxury and M Sport. You can also opt for additional equipment packages and Original BMW Accessories. Whichever model you choose it will come with BMW Business Navigation as Standard. Seeming contradictions yield inspiring design: with its long wheelbase and short overhangs, the new BMW 4 Series Coupé radiates self-assured authority. The set-back glasshouse underlines the distinctive coupé style. The front of the new BMW 4 Series Coupé exudes sporty intent. LED headlights frame the striking double kidney grille, signaling powerful atheticism. The large air inlets with intergral LED Fog lights hint at strength beneath. Wide stance. Short overhangs. A forward-striving front and roofline running progressively to the rear. The design of the new BMW 4 Series Coupé stands for intriguing elegance and pure sporting flair, emphasised further by its athletic tail and rear-set cockpit. Enjoy driving pleasure in a stylish ambience. If there’s an ideal shape for a sports coupé, the design of the new BMW 4 Series Coupé is the perfect template. Its athletic appearance radiates a dynamic presence and features an inspiring interplay of fluid styling and contoured flanks. The unique blend of sports appeal, agility and aesthetics creates a truly complete car. Take the wheel of the outstanding BMW 4 Series Coupé and experience it for yourself. With over 100-years of refining, every BMW model has been crafted to deliver pure driving pleasure. There has never been a more exciting time to drive the open road. Fuel economy figures for the BMW 4 Series Coupé range: Extra Urban 46.3 – 68.9 mpg Urban 25.4 – 52.3 mpg Combined 35.8 – 61.4 mpg CO2 emissions 189 - 121 g/km. Figures may vary depending on driving style and conditions.Figures may vary depending on driving style and conditions.Test drive subject to applicant status and availability.